What Could be Wrong with Unlimited Vacation Time? The idea of unlimited vacation sounds intriguing but is it feasible? Besides sounding like an employee’s dream, strategically, it is a tool that can be used to benefit recruiting, reflect a culture of trust and ease administrative burdens. Like so many ideas that sound too good to be true, it can lead to bigger problems if it’s not managed properly. This is one reason companies are slow to adopt and are watching to see the outcome from Sir Richard Branson’s move to adopt unlimited PTO at The Virgin Group. If all goes well for Virgin, this could be a model for other big companies to follow. According to an article in Employee Benefit News by Dane Hurtubise, less than 1% of US corporations currently offer unlimited vacation days. It is gaining popularity as companies like Netflix, Best Buy, Evernote and Motley Fool adopt the program, however. In terms of employee engagement, unlimited vacation days has considerable merit because it implies a strong relationship between employee and employer, based on trust, which is one of the foundations for achieving engagement. But just like as adopting an open office plan, ‘each company should carefully evaluate and research if it is right for them’. 1. Saving up vs. recharging. Unlimited vacation is a great way to keep employees fresh and energized. By encouraging employees to take off when they need, employees can consistently stay closer to 100% rather than waiting to spend vacation days in bulk after they have already experienced burnout. Taking smaller breaks can bolster work output and prevent extended stretches that degrade employee happiness. 2. Trust and flexibility. Policies such as unlimited vacation can foster a greater sense of trust and mutual respect between an organization and its employees. 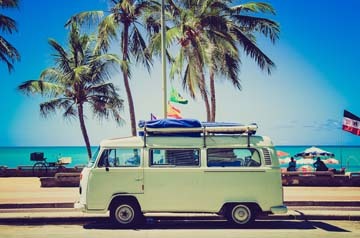 Companies who implement unlimited vacation often feel that it is disingenuous to expect employees to immerse themselves in their work and also be able to distinguish between paid time “on” and paid time “off.” The policy also relies on employees to take time off within reason, which extends a certain degree of trust between them and their employer. 3. Reduces administrative work. Companies with an unlimited vacation policy do not have to monitor and track time-off against vacation balances. This can eliminate common issues with self-reporting and aligns policies to the now modern conflation of work and life. Unlimited vacation also frees up time for managers and finance departments by reducing the work involved when an employee leaves the organization since there is no concept of “payouts” for unused vacation time. 4. Being a peacock. Unlimited vacation can be an asset when it comes to recruiting since the benefit is extremely attractive to potential hires. In industries that have adopted a management philosophy of a Results-Only Work Environment (ROWE), where workers are evaluated on the basis of their output rather than the number of hours they work, unlimited vacation aligns that thinking and helps convey the correct messaging to candidates. 1. Unequal opportunity. The biggest pitfall with unlimited vacation is making sure that all employees are given equal, time-off opportunities. Everyone cannot be out at the same time. This can be mitigated though good management, but even diligent managers can’t always coordinate everyone’s schedule to properly be fair and effective. 2. Not all jobs are created the same. This policy isn’t feasible for all types of work. Employers with large numbers of employees, for instance, would have a much more difficult time managing and implementing the policy. Organizations with hourly or seasonal workers would in theory lend themselves nicely to implementing unlimited vacation since they need to comply with state and federal wage-hour laws, but it actually becomes burdensome and more difficult to manage productively. Unlimited vacation can also cause issues when deployed at international organizations that operate in countries that have mandatory minimum vacation time. 3. The paradox of choice. It turns out that humans are inherently bad at understanding the concept of unlimited and are often overwhelmed by it. This leads to many employees taking less time off and becoming disengaged at work over time. Studies have shown that this is a very common occurrence, especially within the first year of implementing unlimited vacation. Many people decide not to take advantage of their vacation time because it’s too difficult to figure out the right amount to take. For some, this can be seen as a duplicity that discourages employees from taking any time off at all.